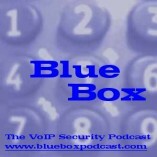 Welcome to Blue Box: The VoIP Security Podcast #73, a 44-minute podcast from Dan York and Jonathan Zar covering VoIP security news, comments and opinions. Download the show here (MP3, 20MB) or subscribe to the RSS feed to download the show automatically. NOTE: This show was recorded on December 11, 2007. NAT P2P SIP slides are realy under p2psip-3 directory under slides directory.